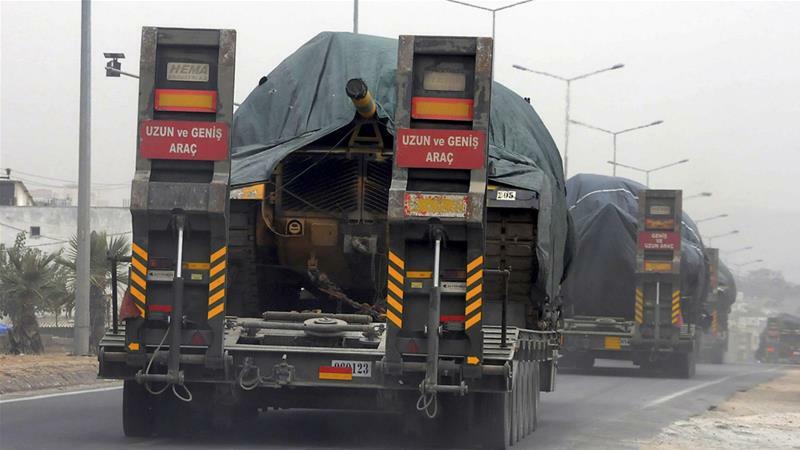 Antakya, Turkey - Turkey continued to deploy troops and heavy weaponry to its southwestern border with Syria in anticipation of a major offensive by the Syrian government and its allies on opposition-held territory. A Turkish military convoy arrived at a Turkish outpost near the town of Morek, in Syria's northern Hama province, early on Thursday. Al Jazeera also observed the arrival of a military p lane that unloaded dozens of Turkish soldiers at the civilian airport in Hatay province, about 50km from the Turkish-Syrian border. It was not immediately clear whether the troops were heading across the border. Turkey already hosts three-and-a-half million Syrian refugees and is fearful of another major influx if Syrian forces - backed by Russian airpower and allied militias - attack the last remaining stronghold of opposition fighters in Idlib province. "If you look at the types of those weapons systems, I would say they are all for defensive purposes. So I don't think Turkey has offensive intention and capability to militarily intervene in the Idlib conundrum," he told Al Jazeera. "This is sort of the preventive, defensive military buildup to manage the anticipated refugee flow because of this push of Russia-backed Syrian for ces from the south." Nearly 40,000 people have already fled Idlib after Syrian-Russian air strikes intensified over the last two weeks. The UN estimates, in a worst-case scenerio, about 900,000 civilians could flee Idlib if a full-scale ground offensive begins. The outposts were established after a de-escalation agreement was reached between Turkey, Russia and Iran in July 2017. Areas in Deraa and Homes provinces and the suburb of Eastern Ghouta were also part of the de-escalation deal, but over the past few months they have bee n captured by Syrian government forces backed by the Russian air force and pro-Iranian militias. A confrontation between Turkish forces and those backing the Syrian government are "highly unlikely" if the offensive on Idlib goes forward, said Gurkan. Russia continues to control Syria's airspace, he noted, and Turkey is unlikely to initiate any military action there without Russian approval. "I don't expect a large-scale ground offensive [by Syrian forces]. It is going to a gradual, incremental siege warfare that could last maybe nine to 10 months," said Gurkan. "These are Russia-endorsed obse rvation posts, the prime objective of which is to prevent the expansion of pro-Iranian Shia militias from Aleppo to Idlib," he said. According to Gurkan, Russia also wants to limit Iranian influence in Syria and prevent it from spreading into Idlib province.